Linhartovy castle was built in the second half of the 16th century by rebuilding of a local fort into a Renaissance seat of Václav Haugvice catholic nobility members. A closed inner courtyard, a defensive tower and especially basement vaulting have been preserved since the very beginning. A sgrafitto plaster in the tower has also been partly preserved. Figural sgrafittoes are still visible in an arcade corridor on the 2nd floor of northern castle wing. In the second half of the 17th century, the castle was extensively dilapidated. New owners, Sedlnický of Chotice, started with a complete reconstruction into a Baroque style. An ornamental park in a French style was established by the castle at that time. Later in the 19th century the park was modified into a natural-landscaping park. The castle was modified again in the 18th century. In the first half of the 19th century, the village changed the owner. It was gained by Oppersdorf family and later at the end of the century by Wanzelides, a rich family of Krnov. In 1930 the castle was bought by Wüllersdorf and Urbair families. And the castle was modified again. In 1943 a German army hospital was placed into the castle. Unfortunatelly a fire broke out and the roof burnt down. In 1944 the roof was temporarily covered with a cardboard. Between 1945 and 1965 the castle was a property of the state. In 1947 a strong gale damaged the roof and climatic impacts disrupted ceilings and walls. The maintenance did not start earlier than in 1957. 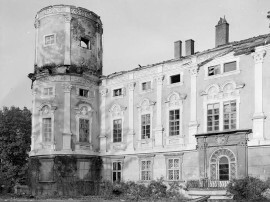 In 1966 a company “Zdravotnické zásobování” became a new owner of the castle and it was partly reconstructed. In 2001 the castle became a property of a local community and it is being gradually reconstructed up to now. In September 2007, the castle was hit by floods. Since May 28 2005 the castle is opened to public. In Linhartovy castle there is a permanent exposition a rare ceramics by Mr. Kutálek, Christianity, Citra, history of gendarmerie, galery of harmony and especially students´ gallery of art workshop from Město Albrechtice. In castle premises concerts, vernissages, traditional Easter fairs, summer events for children such as communion of children to kindergartens and first-graders to elementary schools, a night castle tour concluded with a great fireworks. If you are interested in tour except the opening hours ( a group of at least 20 people), please contact a castle warden on the phone +420 728 323 270.